Throughout the months of December and January I worked as a DP for a company called Onyx. 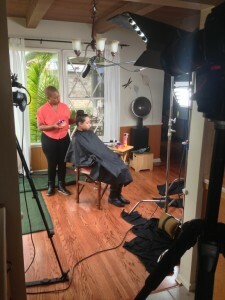 I was responsible for shooting numerous video tutorials about various hair and make up styles as well as “get to know me” videos for different stylists and models. I had done some beauty lighting in the past for a few promos but this was really my first big gig that I knew would want that soft, shadowless beauty look. I lit mostly with Kino’s through unbleached muslin. I ended up putting the lights as close as I possibly could to the lens so that the source was as frontal as it could be, creating little to no fall off. Muslin really helps spread the light and give it that even, sourceless look. One of the biggest challenges on this shoot was managing the location. We shot in a bathroom that was pretty much a hall of mirrors. It seemed like everywhere we put a camera or a lighting fixture, it could be seen in the reflection of a reflection of a reflection somewhere. What really ended up saving us was that the tile in the bathroom was almost exactly the same color as unbleached muslin so we were able to cover some of the mirrors that were not in frame with that in order to eliminate some of the double reflections. The reflections in the mirrors that we kept uncovered really added some depth to the frame. (ABOVE) The A cam was a 5D MKII which I kept mostly at a 2.8-4.0 split. The shallow depth of field really helped hide the fact that some of the background reflection was not actually tile, but unbleached muslin. The B-cam, used for close ups was a Sony EX1. We used an SFX1 filter on this cam to help soften the EX’s sharper image and we were almost always on the tight end of the lens to help match the shallow depth of field of the 5D. I also tweaked the picture profile settings to lift the blacks and create more of a low con image in camera. It’s a bit tough to match the two cameras as they have different sensors, lens characteristics etc. but we did the best we could in camera and the rest was tweaked in post. Moving forward we will be shooting on two of the same cameras but because of the budget and last minute nature of this gig, I pooled the resources I had available and we made it work with two different cameras. I learned a pretty big lesson on this shoot involving color. We were shooting in the home of one of the stylists and we lit the scene very much the same way we had been lighting every other video but for some reason I wasn’t liking the image. I kept looking at it and wondering what was wrong. It was lit well, no shadows, proper exposure, shallow depth of field etc. I put the thought out of my mind and continued on to the next set up. The next set up involved exactly the same actors doing basically the same action, but just in a different setting. I lit it the same way and when we were ready to roll I looked at the image and thought, this looks great. I stopped for a second to think about why this image looked so much better than the last. I realized that the difference was in the color palette/tone. The first set up had a beautiful stone fireplace with a wood mantel in the background. The talent was African American women wearing jeans and a shirt of a darker tone. It seems so obvious now what the problem was but at the time I didn’t realize it. I just saw a beautiful stone fireplace and wood mantel with great texture and thought, that will be a perfect backdrop. There was no color contrast in the image at all. Although the textures were great, everything in the frame was dark brown or black. The colors in the frame also did not portray the right message. We were trying to go for a bright, upbeat, happy tone with these pieces and none of the colors were reflecting that tone. Although it was lit properly and exposed correctly, the colors in the frame were just all of varying darker tones. The image still looked good, but it was that subtle difference in color tone/pallet that was the reason why I wasn’t liking it as much as the second set up. The second set up had a white background with some bright green vegetation that could be seen through some open windows in the background and the talent was wearing a bright pink shirt. (ABOVE LEFT) It seems so obvious now but all those colors created a much more upbeat, bright feeling frame than the previous. The white background also created separation through color contrast as the talent had a darker skin tone. A subtle difference in wardrobe choice or set decoration can make a huge difference in the quality of your overall image. The color of each item in the frame and it’s relationship to the color of other items can be the difference between something that looks good, and something that looks great. I’m really glad I was able to take this simple but immensely important lesson away from this job. I will take this with me and remember it always as I continue on my journey as a DP in this industry.